There are hardly words to describe how much I love sushi. When my son, Zach, and I go on a ‘foodie adventure,’ we almost always end up at a sushi place. He orders Spider and Dragon Rolls. My vegan sushi can be hit or miss—sometimes great, sometimes bland and boring, since yummy stuff like siracha mayo and tempura isn’t usually vegan. Making your own sushi bowl at home is loads cheaper than eating sushi out. 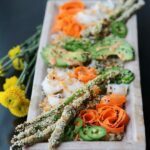 And crispy spicy sushi bowls are healthier than traditional sushi, too, with whole-grain brown rice (there’s a neat little trick to make it taste like more sushi rice) and baked, panko-breaded asparagus rather than fried tempura. In fact, because it’s a few easy recipes in one, crispy spicy sushi bowls would be a perfect dinner to make with friends. So next time your vegang is in the mood for sushi, invite them over to your place to make crispy spicy sushi bowls! Or make a gorgeous date-night sushi bowl for two, like this one. ? 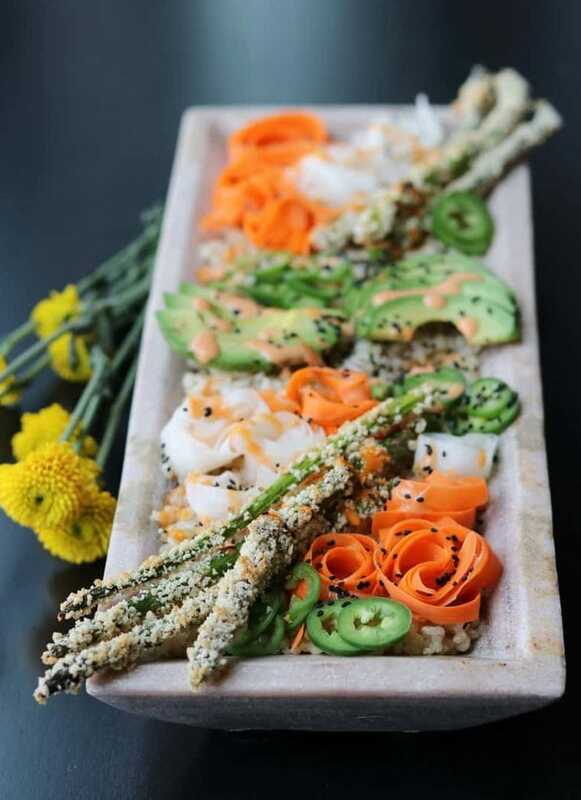 Vegan Crispy Spicy Sushi Bowls are packed with everything we love in sushi—crispy asparagus, spicy sriracha mayo, lightly pickled veggies and creamy avocado. Cook rice according to directions. When it's cooked (about 30 minutes), set aside to cool. In a small bowl, mix the ground flax seed and 6 tablespoons of water, and allow to set for at least 15 minutes. 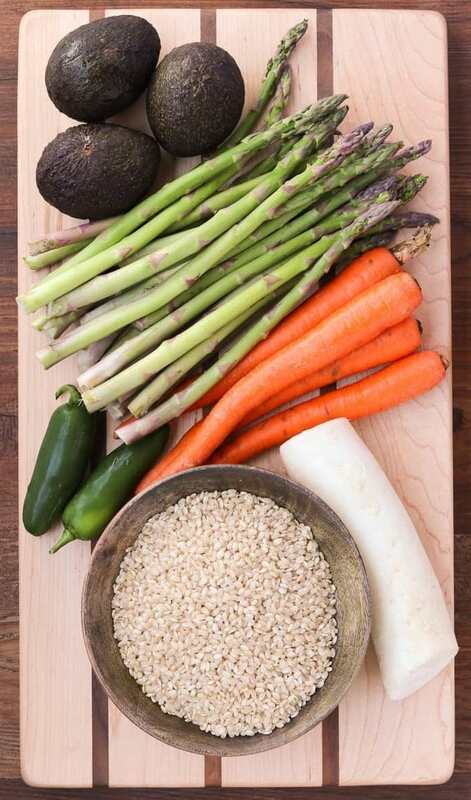 For the pickled veggies: In a medium bowl or plastic container, whisk together 1 cup of water, the rice vinegar, sea salt and brown rice syrup. 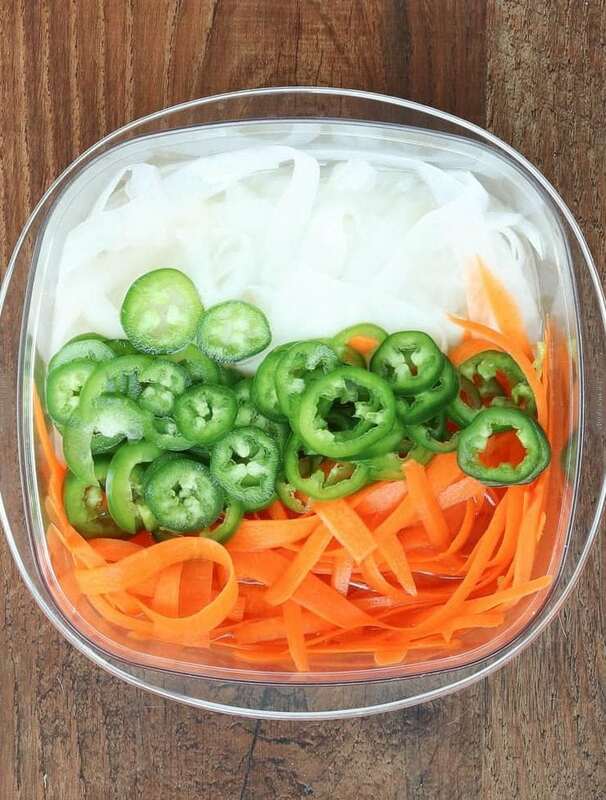 Add the carrot peels, daikon radish peels and jalapeno, pushing them down into the liquid. Allow them to rest for at least 15 minutes. (See notes) When ready, drain the veggies BUT RESERVE THE LIQUID. 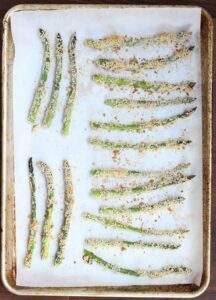 For the panko crusted asparagus: Set up a breading station for the asparagus, with the flax mixture in one dish and the panko bread crumbs in another. (Flat plastic storage containers or pie dishes work well.) Line a baking sheet with parchment paper. 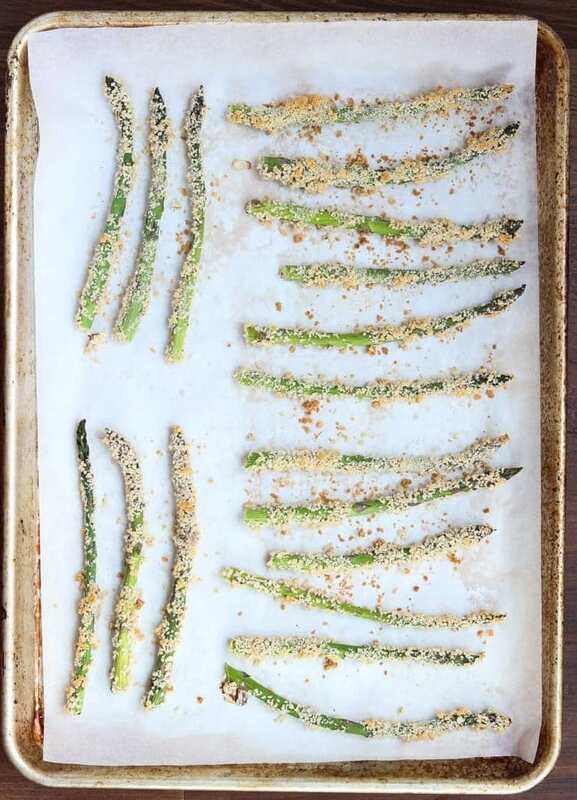 Bread the asparagus spears one at a time, and place them on the baking sheet, spreading them out. Bake at 425 degrees for 15-17 minutes, or until tender and golden brown. For the siracha mayo: In a small bowl, combine the vegan mayonnaise, siracha and rice vinegar and whisk together. Adjust for desired spiciness/thickness. For sushi flavored rice: Stir 1/2 cup to 1 cup of reserved pickling solution into the cooled brown rice. Peel, pit and thinly slice the avocados. 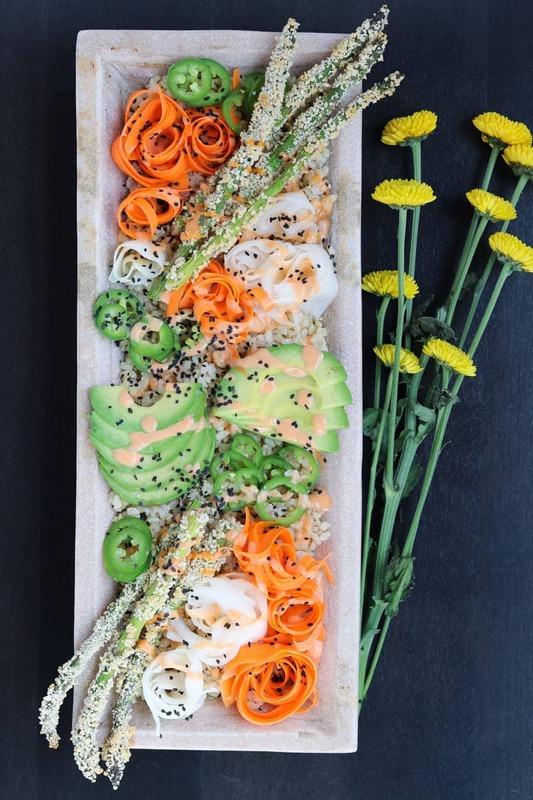 To assemble the sushi bowls, evenly divide the ingredients into bowls, with rice on the bottom, and pickled veggies and avocado slices on top. Drizzle with siracha mayo. Optional: Garnish with sesame seeds, nori sheets (on the side, or crumbled on top). Serve with soy sauce, wasabi and pickled ginger if desired. As the carrots get skinny from peeling and hard to hold, its easiest to lay them down on the cutting board and peel. To create the jalapeno rings, I cut the top and bottom off the peppers, then used a small paring knife to cut around the core to sever it. You can poke your pinky finger into the pepper to get core out once you've separated it with the knife. Then, I sliced the peppers into rings. The veggies become more pickled AND spicier the longer they sit. If you don't like heat, pickle the jalapenos separately or skip them altogether. For more heat/pickled flavor, let the veggies marinate up to an hour. Make sure all of the veggies get mixed/pushed down into the liquid-stir from time to time if needed. I suggest slicing the avocado at the end to prevent it from turning brown. Nori snacks are cheap and easy to find-1 individual snack package can garnish the entire recipe! Make sure to check labels and find some that aren't too salty. Thank you, and you are most welcome. Keep cooking! This is seriously so beautiful! I really appreciate the breaded asparagus too. What a great idea to use Panko bread crumbs along with flax. Super crispy and healthy! This looks incredible, and much less effort to make than sushi. Also loving the jalapenos and sriracha additions, spicier is always better in my book! Beautiful and a nutritious share.. I will love to try this as there is no stuffing and rolling required. A healthy treat for a quick dinner or serving to guests at party!! Thank you! I love sushi, no matter what shape it comes in 🙂 I agree, I think this would be a really fun dish to serve to guests–or even get everyone in the kitchen to make it together.